NOAA Fisheries, the U.S. government agency that oversees the conservation of marine species, de-listed the eastern Steller sea lion from the Endangered Species List, effective on December 4, 2013. The de-listing acknowledged the rapid increase in the abundance of the population as well as the desire to balance conservation of the sea lion and one of its primary prey species, the white sturgeon. The Steller sea lion (Eumetopias jubatus) is one of the largest members of the marine mammal group known as pinnipeds (seals, sea lions and walrus). Males grow as large as 2500 pounds; females are about one-quarter that size. Males can live to age twenty, but females are known to live for thirty years or more. Males defend territories and mate with large numbers of females. They reside in colonies that may contain hundreds of individuals. Steller sea lions live along the Pacific coast of the U.S. and Canada, from northern California up to and around the Alaskan coast. The species is divided into two subgroups, the western and eastern populations; the dividing line is in southern Alaska at Cape Suckling. The de-listing covers only the eastern population. The western population is still listed as endangered, its abundance having plummeted mysteriously since the 1970s. But the eastern population has done spectacularly well. In 1979, the population stood at about 18,000 individuals; it was listed as an endangered population in 1990. Since then, it has been increasing at more than 4% per year, above the goal stated in the population recovery plan. As of 2015, the population numbered over 80,000 individuals. An evaluation for de-listing had been requested by the fisheries and wildlife agencies of Washington and Oregon in 2010. Those states feared that the rapidly expanding sea lion population would have a negative impact on salmon populations, many of which are also endangered, and the white sturgeon. Sea lions have learned to congregate at the base of dams on major rivers, where fish concentrate during their upstream migrations. Populations at the base of Bonneville Dam on the Columbia River have become particularly abundant and problematic. The fish are easy prey for the sea lions, and white sturgeon populations in the Columbia River have declined in parallel to the increases in sea lions. Removal of the eastern Steller sea lion from the Endangered Species List means that the species will no longer receive intensive monitoring and priority consideration when actions are proposed for managing rivers, dams and other wildlife populations. However, the U.S. Marine Mammal Protection Act continues to protect this species and all other marine mammals from harvest. Columbia River Basin Bulletin. 2013. Steller Sea Lions Delisted; Gives States Option Of Seeking Lethal Removal Below Bonneville Dam. Fish & Wildlife News, October 25, 2013. Available at: http://www.cbbulletin.com/428830.aspx. Accessed December 4, 2017. IUCN. 2017. Eumetopias jubatus. IUCN Red List. Available at: http://www.iucnredlist.org/details/full/8239/0. Accessed December 4, 2017. NOAA Fisheries. 2013. NOAA removes the eastern Steller sea lion from the Endangered Species Act list. Available at: http://www.nmfs.noaa.gov/mediacenter/2013/10/23_10_essl_delist.html. Accessed December 4, 2017. NOAA Fisheries. Steller Sea Lion (Eumetopias jubatus). 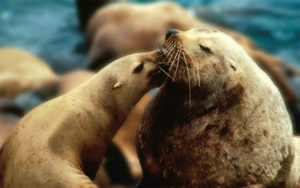 Available at: http://www.nmfs.noaa.gov/pr/species/mammals/sealions/steller-sea-lion.html. Accessed December 4, 2017.